Under normal conditions, smoke comes out of your exhaust tailpipe. Internal combustion engines burn a mixture of air and gasoline to move the car. The afterburn gases consist of hydrocarbons which are harmful to the environment. The catalytic converter uses a catalytic process to remove the harmful gases leaving carbon dioxide and water. But, there moments – especially with old cars – you will notice a thick white smoke coming out of your engine bay. This may signal serious engine trouble, and you should have your engine checked immediately. This article explores some common causes of white smoke coming from the engine. During cooler days it is normal to see some white smoke coming from the engine. Internal combustion engines operate through the ignition of the air/fuel mixture and produce carbon dioxide and water as byproducts. Little smoke is to be expected due to the condensation of water from the exhaust gases. Also, condense on the heated engine parts. This is visible early in the morning, but if it continues throughout the day, then you should call your mechanic for further investigations. The ignition moves the pistons up and down in the combustion chamber and this, in turn, moves the crankshaft, causing the car to move. The engine does get hot with time, and the coolant comes into play to cool it. When the coolant is heated up, it will produce white smoke. The most common cause of white smoke from the engine bay is a coolant leak that is leaking on a heated part like the exhaust manifold. Open the hood and check for any noticeable coolant leaks. Remember that the coolant gets over 90c hot and you should be very careful when checking this. If your car is overheating, it will push out coolant from the coolant reservoir which will get in contact with hot parts and condense and producing white smoke. Check your temperature gauge to make sure that it’s not overheating. A failing serpentine belt can also cause white smoke in the engine bay. However, this is often noticed with a smell of burning rubber. Check the serpentine belt and make sure that it’s tightened correctly. 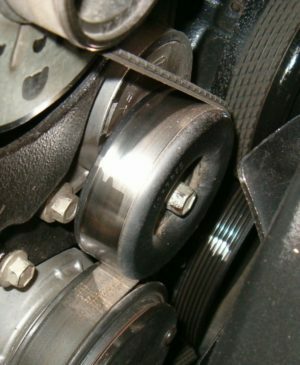 A bad serpentine belt will often cause a loud squeeze also. Also, check the alternator and make sure you can turn it freely after releasing the serpentine belt. A bad valve cover will cause engine oil to leak to the exhaust manifold. If this is the case, you will also notice a strong smell of burned oil. Check for any oil leaks around the valve cover gasket. Check for any oil leaks around the engine block to see if you can localize any leaks. Check around the oil filter gasket and oil pipes located at the top of the engine. The first thing you have to do to locate the problem, whenever it is white smoke from the coolant or from an oil leak. Leaking coolant is a leading cause for white smoke coming from the engine. The cooling system flows from the radiator to the engine block. Begin by checking coolant levels in the radiator. Do not attempt to open the radiator cap when the engine is still hot. Once cooled check the coolant reservoir and radiator hose pipes for any signs of leakages. The engine passes off various types of exhaust smoke – white, black, grey and blue. You need to identify each for accurate diagnosis. When the exhaust emits black smoke, it means that gasoline has flooded the combustion chambers and it is not fully ignited. You will need to check for clogged fuel filters, malfunctioning fuel injectors, and sensors. If you notice a strong smell together with the white/gray smoke from the engine bay – it is most likely an oil leak. 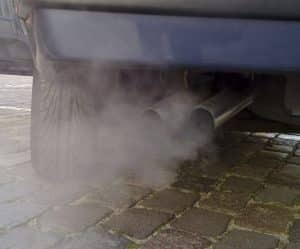 It is normal for the vehicle to emit white smoke during startup in the morning or during cold seasons. The catalytic converter turns hydrocarbon gases to carbon dioxide and water in the exhaust system. This water often condenses in the muffler and exhaust pipes. When you start the car, the engine heats up, and these water droplets are emitted as white smoke. However, the white smoke persists it could mean that the coolant is leaking to the combustion chambers. A damaged head gasket or cracked engine block leak coolant. White smoke accompanied by a sweet smell signals that oil is leaking to the cylinders. You will need to check the piston rings for wear and tear. The thickness of the smoke determines how seriousness of the problem. How Hot Does An Exhaust Pipe / Muffler Get?